Andrew recently attended an Identification of Human Remains in the Field Workshop in Melbourne run by Marc Oxenham PhD, SFA and Anna Wilson BA (hons) of Australian National University (ANU). The workshop provided participants with the opportunity to learn methods to identify human remains in the field and also how to make distinctions between human bones and those of similar-sized native animals such as kangaroo and introduced farm animals such as sheep. 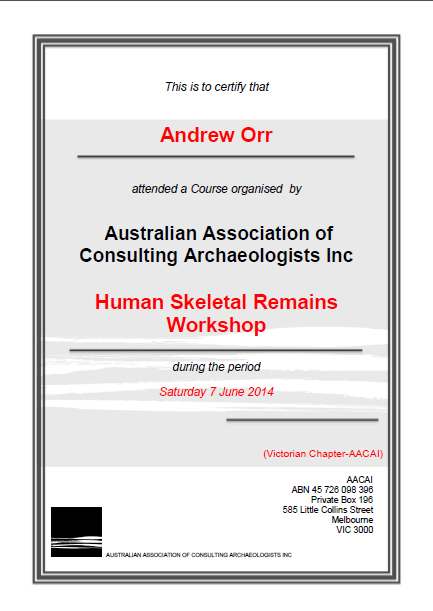 Having had a staff member attend this workshop, we now feel we can provide higher levels of certainty in rapidly assessing discoveries of bones in the field, therefore minimizing the potential for unnecessary distress to Aboriginal communities as well as costly delays for clients when animal bones are mis-identified. Rapid assessment will also allow us to quickly initiate relevant procedures and protective measures should we encounter human remains in the future.